Following my article debunking myths about invoice finance for recruiters, this one looks at some of the misunderstandings and myths about factoring for recruiters. I have included an infographic, with instructions below about how you can add it to your own site or blog. <a href="https://www.fundinvoice.co.uk/recruitment/myths-factoring-for-recruiters-debunked.html" ><img src="https://www.fundinvoice.co.uk/images/myths-about-factoring-for-recruiters-debunked.jpg" alt="Myths About Factoring For Recruiters Debunked" width="450" /></a><br /><a href="https://www.fundinvoice.co.uk/recruitment/myths-factoring-for-recruiters-debunked.html" >Myths About Factoring For Recruiters Debunked</a> by <a href="https://www.fundinvoice.co.uk/" >FundInvoice Factoring Research</a>. 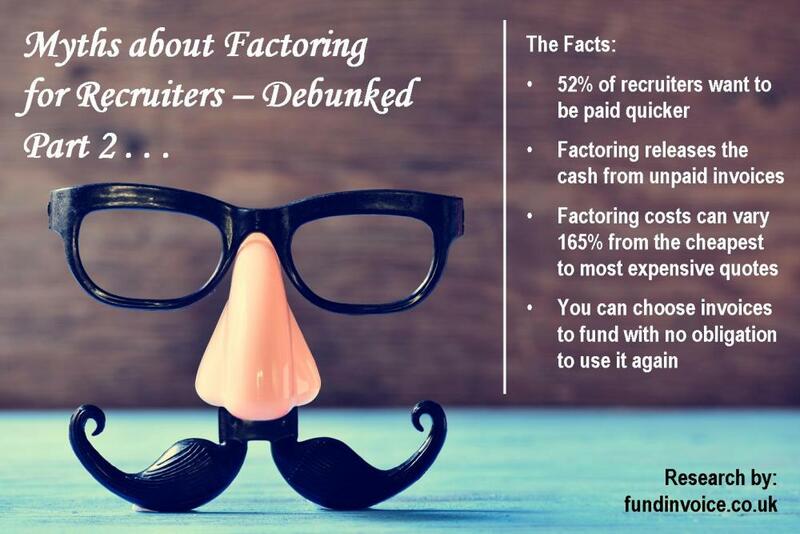 <a href="https://www.fundinvoice.co.uk/recruitment/myths-factoring-for-recruiters-debunked.html" ><img src="https://www.fundinvoice.co.uk/images/myths-about-factoring-for-recruiters-debunked.jpg" alt=" Myths About Factoring For Recruiters Debunked" width="1000" /></a><br /><a href="https://www.fundinvoice.co.uk/recruitment/myths-factoring-for-recruiters-debunked.html" >Myths About Factoring For Recruiters Debunked</a> by <a href="https://www.fundinvoice.co.uk/" >FundInvoice Factoring Research</a>. Gone are the days when recruiters tended to be paid by customers on very short credit terms. Credit periods have dragged out and payment delays are common. Things are now so bad that our research found that 52%, of recruiters that we surveyed, said that they wanted late payments to be addressed so that they were paid more quickly. One way of speeding up payments from customers may be improving your own credit control procedures, that could improve your debt turn, by getting payments in quicker. Perhaps by pre-dunning where you contact a customer before an invoice is due, you might see a slight improvement. However many companies stick to regular payment patterns and that can mean having to wait. For example, some pay the month following receipt of invoice on a set day each week - thats just the way they operate and no amount of chasing will change that. As an alternative you could use a factoring company to bridge the payment gap. The factoring company will provide prepayments against your sales invoices when you raise them, effectively releasing the majority of the value of your invoices, into working capital, immediately. In addition, many companies find that factors are better at collecting money, and can speed up their debt turn as they tend to employ highly skilled, professional credit control staff that know every trick in the book, and how to overcome payment excuses. It doesn't have to be. Factoring prices start from a single fee of £3,000 + VAT per annum to fund against all your invoices, or you could just select invoices that you want funded and pay just for those, without any obligation to fund more invoices. Typically that costs about 2% for every month that you require funding. However, our research has revealed that there are dramatic differences between the cheapest and most expensive factoring quotes. We found a 165% swing between the cheapest and most expensive in a recent mystery shopper exercise. This means that you could end up paying 2.7 times more than you needed to, if you pick the wrong factoring company. Not necessarily. If you don't want to factor all you invoices, then you can use what is called selective, or spot factoring, which typically does not have any contractual lock ins. You just pick which invoices you want finance against and submit those, with no obligation to keep using it. Even if you want all your invoices funded, many factors now offer short notice of termination periods and not all will place a minimum turnover requirement on your business. Hopefully that has layed to rest a few of the many misconceptions that we have come across. If you would like any further help finding a suitable factoring company please contact us or call Sean on 03330 113622.